This August, I will be hosting the Carnival of Mathematics. 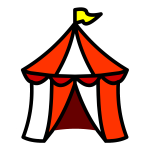 The Carnival is a rotating blog hosted by a different site each month, coordinated by The Aperiodical. The carnival is an excellent idea and provides a great mechanism for cross-pollination between bloggers with similar geeky interests. You can find examples of previous episodes using the link above. I will be hosting episode #125 and, as is tradition, will be posting articles, links, and stories about my episode number. This is an early call-out to readers to see if they have interesting facts about 125 they would like me to publish. If you have any suggestions, please feel free to email them to me using the email address below.